The rancorous debate this winter over a bill to strengthen gun regulation in Vermont has overshadowed the quieter efforts of two lawmakers to target gun suicide. Reps. Teo Zagar (D-Barnard) and Anne Donahue (R-Northfield) argue that the gun-regulation bill has drawn crowds and created controversy but done nothing to address suicide, which accounts for 90 percent of firearm deaths in Vermont. From 2008 to 2012, between 44 and 70 Vermonters killed themselves each year with guns, according to the Vermont Department of Health. Enter the "gun shop project." 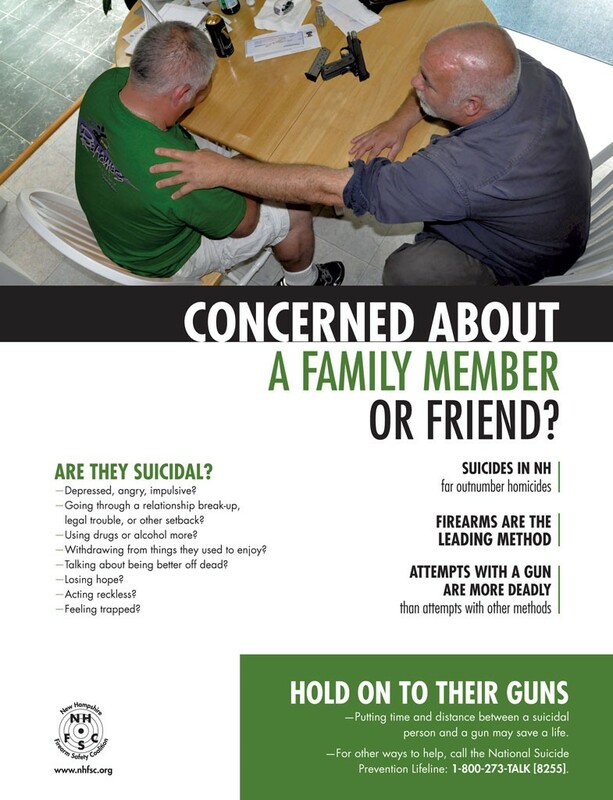 Based on a model developed in New Hampshire, the program helps gun stores make suicide prevention part of their firearm-safety message. Zagar learned of the gun shop project last summer —"I thought, Wouldn't it be a great thing to do in Vermont?" — and saw the voluntary project as a way "to bring both sides to the table and find common ground and actually achieve something." Donahue was already acquainted with the project when Zagar asked her about partnering to promote it. "This is such a valuable tool," she said. "This gets us somewhere we all want to go." The project uses training videos, suicide-hotline cards and posters to achieve two goals. First, to give gun dealers tips on reducing the odds of selling firearms to people who are suicidal. Second, to enlist gun shops in educating their customers about the value of storing someone's guns for them if they are suicidal. Evan Hughes, vice president of the Vermont Federation of Sportsmen's Clubs, said his organization only recently learned of the gun shop project from Donahue. Hughes has encamped at the Statehouse as several Senate committees debate gun issues. "At this point we are dealing with this," he said, pointing to a Senate committee room where deliberations had taken place on S.31, a bill introduced by Senate President Pro Tempore John Campbell that has drawn fire from gun-rights groups. Dressed in blaze orange, opponents swarmed the Statehouse several weeks ago to argue against it. Gun Sense Vermont, which supports the legislation, states on its website that it advocates "for measures that will help keep guns out of the wrong hands." Originally S.31 called for expanding background checks for gun purchases, upholding the federal law of barring felons from possessing firearms on the state level and mandating that the courts report the names of people they have declared dangerous and mentally ill to a federal background-check database. The background-check expansion has since been abandoned, but the Senate committee will talk again this week about the felony possession ban. While gun-rights representatives continue to lobby against any legislation, some say the gun shop project might be a palatable option. "If there is something new that works, we will look at that," said Hughes. "We are obviously interested in firearm safety." Ralph Demicco is cochair of the New Hampshire Firearm Safety Coalition — an ad-hoc, 20-year-old group of gun shop and shooting-range owners, health and safety professionals, and lawmakers that share a commitment to improving firearm safety and preventing suicide. Demicco is also a partially retired owner of Riley's Sport Shop in Hookset, N.H. He recalled a phone call he received in 2009 from Elaine Frank, cochair at the firearm safety coalition. During a seven-day period, Demicco learned, his shop sold guns to three individuals who used the weapons to kill themselves. "I was appalled," Demicco said in a telephone interview. "Nothing in the behavior of these individuals gave a hint." That motivated Demicco to have the coalition investigate the problem. Aided by suicide-prevention researchers at the Harvard T.H. Chan School of Public Health, the coalition came up with a strategy tailored to gun shops. It provides posters that pose the question "Concerned About a Family Member or Friend?" and a recommendation: "Hold On To Their Guns." Cards list suicide-warning signs and provide a local number for the National Suicide Prevention Lifeline. Gun shop owners are encouraged to display those materials in a prominent place — but there's no obligation to distribute them. For their own edification, a video and "tip sheet" offer "signs that a potential buyer could be suicidal." If a customer doesn't know anything about guns, doesn't appear to care what kind he or she buys, has never shot before or only buys a few bullets, gun shop employees should be suspicious. "Options for responding to a potentially suicidal buyer" range from asking the customer why he or she needs a gun to notifying other gun dealers and police. Frank stressed that the project doesn't ask gun shop personnel to become mental-health professionals. "There is a subtle line you have to draw educating people on the role they can play without holding people responsible for decisions other people make," she said. Demicco, an ardent Second Amendment advocate, said it was important to him "to make it a suicide message, not an anti-firearm message." Project planners consulted with gun shop owners to develop the materials, which Demicco said helps explain why nearly half of the gun dealers in New Hampshire have participated in the project since it launched in 2011. "The message is good," Demicco said, noting other places have started the program. Tennessee, Maryland and Las Vegas all have used the New Hampshire project as a model. Catherine Barber, director of the Harvard Injury Control Research Center's Means Matter campaign, which focuses on how people commit suicide, helped design the project. Barber also cowrote a recently published study about the gun shop owners' acceptance of the strategy. It's too early to know if the project is impacting suicide rates. "The number of recent-purchase suicides in New Hampshire dropped after the campaign," Barber said, "but the numbers are small, so they can't be pointed to as statistical evidence of having an impact." One thing is clear: The project has started a conversation in the gun-owning community about how to reduce the risk of suicide by firearm, Barber said. She compared it to spreading the word about having a designated driver when drinking alcohol. Barber said that working similarly with Vermont's gun community would be more effective than drafting laws. "Legislative things really do seem to get people scrambling to their battle stations," she said, while the project's suicide-prevention message complements the strong safety culture in many gun organizations. A study from the Brattleboro-based Center for Health & Learning reinforces that belief. The state-funded study recommended the gun shop project as one of several non-legislative approaches to reaching the people most at risk of suicide by firearm. "Our recommendation is definitely yes, we should do it," said Alexander Potter, the researcher who wrote the report. He made the case that tackling the problem from inside the gun-owning community — using its "culture of watching out for each other" and pride in its commitment to gun safety — would work. "We would love to run with it," Potter said of a potential gun shop project in Vermont. "We would love to be doing the outreach." But center director JoEllen Tarallo-Falk said it was up to the state Department of Mental Health "to decide how and when to move forward." Dr. Jaskanwar Batra, that department's medical director, sees the gun shop project as one of several strategies that would be helpful in reducing suicides — especially by guns. "It makes a lot of sense. Instead of getting in a fight, let's join hands," he said. When asked who should take the lead, Batra said, "I'm not sure. I sense it could be the coalition." Batra meant the Vermont Suicide Prevention Coalition, which includes representatives of the departments of mental health and corrections, the state medical examiner, the Veterans Administration, colleges, hospitals, mental health agencies, families of people who committed suicide, and individuals with suicide histories. The coalition has yet to review Potter's report, Batra said. Frank, of the New Hampshire coalition, stressed the need to include the gun community from the start. Because of the divisiveness of gun issues, she said, "You only get one chance to launch this stuff." Gun Sense Vermont, the organization pushing the bill to strengthen Vermont's gun laws, supports the gun shop project. "We were discussing trying to do something like that two years ago," said Gun Sense president Ann Braden. The group backed away, she said, "because it is important that it come from the gun shop owners." Both sides of the gun debate agree that the project has merit, but many are still unfamiliar with it. Two local gun shop owners said they had never heard about the New Hampshire project, and a spokesman for the National Shooting Sports Foundation — a trade association for gun dealers — also said he didn't know much about it. Jay O'Brien, owner of B.J. 's Hunting and Shooting Supply in Williston, knows that a couple of guns sold at his shop were used in suicides. One was sold to Cheryl Hanna, a well-known lawyer and legal commentator who took her own life last July. "She fooled us," O'Brien told Seven Days in an interview last September. He said she appeared calm and poised when she came in to purchase the gun. "You can't tell," O'Brien said, echoing Demicco's point. "We ask leading questions, but if they lie to us?" O'Brien said the description of the gun shop project "sounded like most of it is common sense." Back at the Statehouse, Sen. Claire Ayer (D-Addison), one of S.31's sponsors, learned of the gun shop project during testimony on the pending bill two weeks ago. Ayer described how people from both sides of the gun battle huddled outside her committee room for a few minutes to talk about the project, adding, "That may be one of the best things that has happened because of this bill." The original print version of this article was headlined "Lay Down Your Arms: Suicide Prevention Could Unite Both Sides of Gun Battle"